Worship started at 10.00 AM, where the worship leader invited congregations to praise and worship God. All of them praised God joyfully. 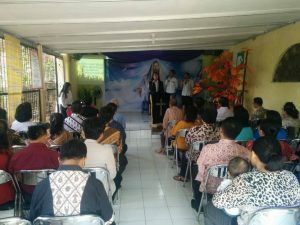 In this service also present God’s servant from GPSDI Cinere Rev. Somba, S.Th. The service continued with airing a film of healing testimony of a woman whom God healed from pain on her legs where she was previously unable to move the legs, but now the legs can be moved. They seriously saw this healing testimony. Word of God was delivered by Rev. Hanung Prasetyo, from KPPI team who preached about a woman who had bleeding taken from Mark 5: 20-25. She suffered from bleeding for 12 years and she had faith in God. In the mist of the crowd, the sick woman to try to touch the tassel of Jesus’ robe. And because of her faith, she received healing. Afterward, God’s servant invited the congregations to believe in the Lord Jesus. Praise God whole of them wanted to believe in the Lord Jesus as their Lord and Savior. And Rev. Lenny Maria, the KPPI team continued to convey the Word of God concerning the healing taken from Isaiah 53:5. She said that all our sicknesses have been borne by the Lord Jesus and by His stripes then our illness healed. 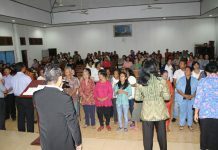 During the prayer of healing, many sick congregations came forward to be prayed by the Lord’s servants and counselors. Praise God, on that day many of them were recovered, among others there was someone who was cured from pain in the chest, also someone who had stroke where previously was unable to walk, when being prayed already started walking. There was someone who had lump on the chest, God healed and the lump got smaller. The pain on the spine, bleeding, and other illness God cured. Hallelujah, the Lord Jesus does not change, He visited His people. 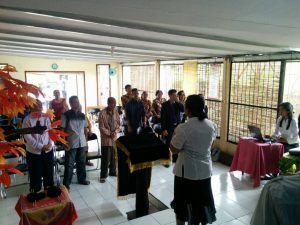 On that day all congregations and servants of God were grateful seeing the great things which God did at KPPI in GPIN Singkuk, Cinere, Depok.